Tyrolia has been around a long, long time. I remember my first alpine bindings were full metal Tyrolia something-or-others complete with straps that would freeze your hands off each time you put them on or took them off. This was before the days of advanced plastics and ski brakes (I told you it was a long time ago). Tyrolia has been around for 84 years and has dominated the alpine binding market for almost as long. It was only natural that they put their know-how to good use and got into the growing alpine touring market since they have been developing AT bindings since the 50's and well through the 80's. Last year the appearance of the Tryolia Adrenalin 16 AT Bindings ushered in the new era of Tyrolia AT bindings. 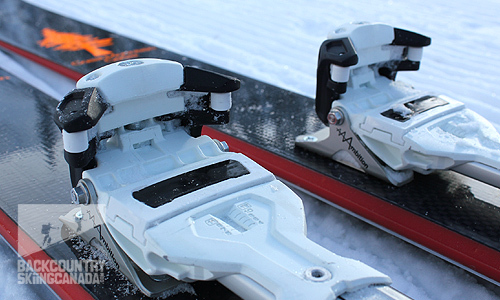 The Adrenaline falls into the same category as the Salomon Guardian WTR 13 and and the Atomic Tracker 16 which is essentially the same binding, with different branding. The Adrenaline was a welcome addition to this new heavy weight segment of the AT binding market but it raised the question, what about us light weights who are more concerned with efficiency than show, and prefer the (real) backcountry to sidecountry? 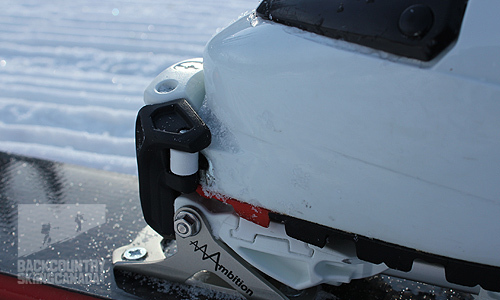 Enter the Tyrolia Ambition 12 AT Binding which is a new light weight option in the alpine touring frame binding market. 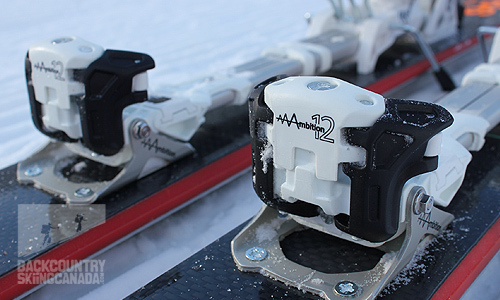 Check out the video below to see how the Tyrolia Ambition 12 Bindings work in the field. At 1930 grams the Ambition is much lighter than the Adrenaline but doesn’t give up much in the way of performance in order to save a big chunk of weight. In fact, the Ambition adds in a few features which are pretty ingenious. Rather than a dual metal frame, the Ambition uses a single telescoping frame to provide support and rigidity while allowing you to easily adjust for different boot sole lengths. 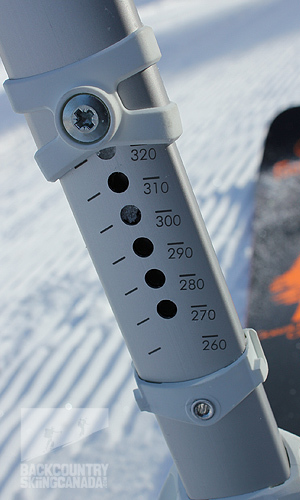 This is a great feature if you have multiple boots and hate to continually adjust your bindings depending upon which boot you want to ski in. The toe piece also provides vertical adjustability in order to accommodate both alpine boots and touring boots, something those other bindings just don’t deliver. The toe also pivots a full 90° to provide more than enough natural stride while skinning, even when the skin track seems to go straight to the stratosphere. On the back end the Tyrolia Ambition offers up four climbing aid heights. Simply unlock your heel with your pole and you have one option down and three up with angles of 5°, 10° and 15°. 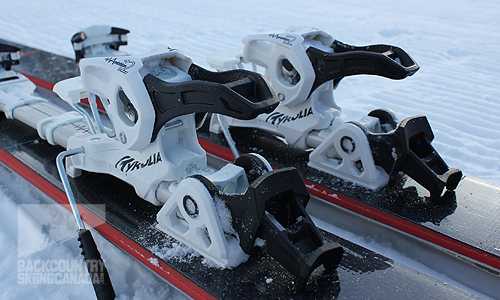 You also don’t need to step out of the binding in order to switch between ski and walk modes unlike the Marker F12 AT Bindings or the Tour F10's. Toe piece close ups front and back. Heel piece close ups front and back. The Tyrolia Ambition AT bindings have an Alpine Touring Toe which fits both alpine DIN and Alpine touring DIN soled ski boots. A simple height adjustment on the toe piece will accommodate any boot height including those with a generous toe rocker. The mechanical AFS glide plate in the toe provides constant release values and works with rubber soles, like the Vibram soles found on most alpine touring boots. Two built in rollers provide smooth and rapid extraction from the toe piece as well as boot re-centering. 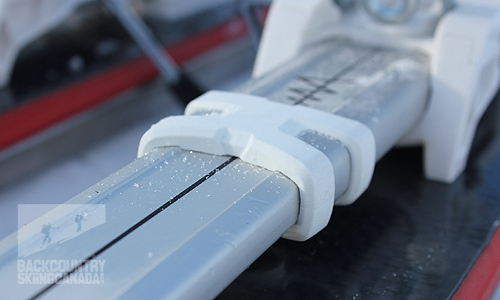 At 65mm wide the Tyrolia Ambition Binding has an adequate platform from which to drive today’s wider skis and provide solid power transmission. 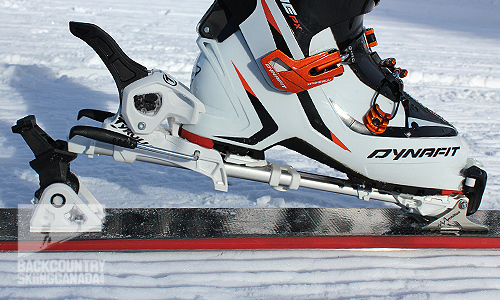 The 90 degree tilt and a pivot point located at the front of the ski boot provides a natural walk mode compared to other bindings that do not offer these options. 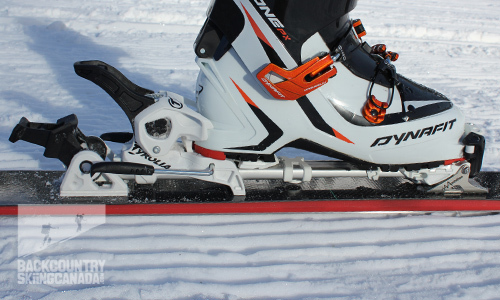 Below you can see the Dynafit One AT Boots fit perfectly snug. The lightweight telescopic tube design is unique to the Tyrolia Ambition Binding and offers quick adjustment with a standard Philips screw driver. This allows you to use different boot sole lengths with one ski/binding set up as it can accommodate sole lengths from 260mm up to 350mm. The strength of this telescoping tube design not only provides versatility but it also minimizes any chance of mid-point deviation. The Tyrolia Ambition AT Binding offers four different climbing aid positions 0°, 5°, 10° and 15°. 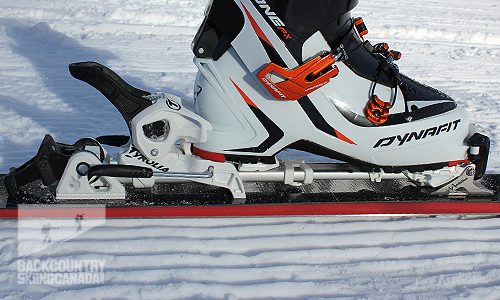 Each position is activated with your ski pole once you unlock your heel to compensate for steeper ski track climbing. 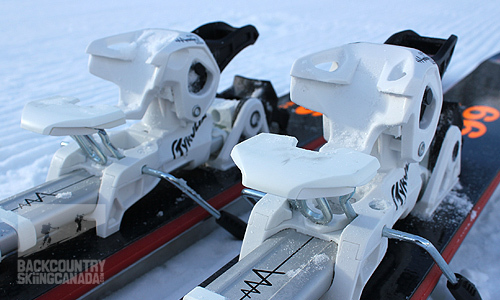 Crampons are also available in widths of 90, 105 and 120mm to provide a sure grip for glacier travel, firm snow and ice. Heel released and zero degrees inclination. For five degrees you would push the heel riser down. 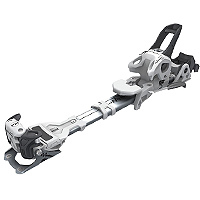 The Tyrolia Freeflex System offers flex between the toe piece, telescopic tube and the heel piece which provides a natural and dynamic ski flex that eliminates the dead spot that most frame alpine touring bindings create. 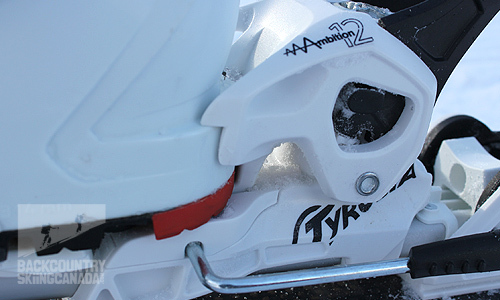 Tyrolia entered the alpine touring binding market last year with the Tryolia Adrenaline 16 AT Bindings and this year they have come to market with a much lighter (732 grams to be exact) AT binding for those who are more weight conscious and less concerned about huge DIN’s and hucking their meat. The Tyrolia Ambition bindings have a few innovative features that are a big improvement over the industry leader Diamir Fritchi. The telescoping metal frame provides not only a solid feel and incredible rigidity that is typically found in much heavier bindings, it also provides a one-size-fits-all adjustable approach for an AT binding which is a welcome option for this reviewer. It is like having a rental binding without all the downsides of a rental binding. The heel lock mechanism is also another unique feature as it engages from above and not from behind, like the Fritschi designs. This means that it’s less likely to scour away the plastic contact point and create some less than desirable tolerances over time. I did however experience some ice and snow build up under the heel which prevented a simple and smooth heel lockdown after climbing the skin track. Be forewarned that on less than cold smoke days you will need to pay special attention to the accumulation of snow under your heels before you try any Hulk Hogan moves to lock your heel back down. Overall the Ambition Binding is light, secure, releases well and provides everything you need for touring. 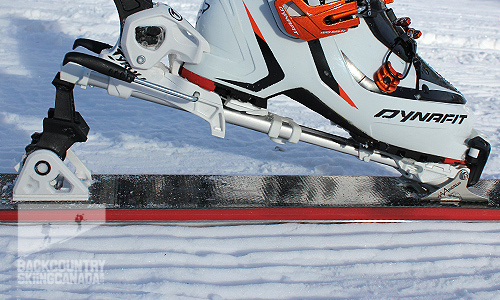 The heel height adjustment is easy to use and provides four unique positions to tackle any skin track. Also, in the weight department the Ambition is slightly better than the Diamir Fritschi Eagles—nicely done!